Recently, whilst I was researching some pretty cool yoga mats (check out my article - 5 Sustainably-Harvested and Eco-Friendly Cork Yoga Mats) I stumbled upon cork. Obviously I was well aware of the existence of cork, albeit mostly in the form of bottle stoppers and notice boards, but I hadn’t really given a thought to where it originated from, although I was pretty sure it was from a tree of some kind. And my oh my …..what a magnificent tree!!. . Did you know that cork harvesting is without a doubt the most ethically sustainable form of forestry in the world. Stick around and I will explain to you the wonders of cork! ﻿Cork comes from the Cork Oak, or the ‘Quercus suber’ as my mother would so eloquently say…..she does have a tendency to break into Latin from time to time. The Cork Oak is native to and only found around the Mediterranean basin of Southwest Europe and Northwest Africa, with most of the forests to be found around Portugal and Spain. The ancient Greeks and Romans were aware of the value of cork bark, however, it only began to be harvested commercially in Portugal about three hundred years ago. Although it’s not widely known, the cork industry is helping to sustain one of the world’s most biodiverse forests. Cork is unique in the way that it is harvested in that no tree is ever cut down. This fact alone makes it a highly sustainable practice. So how is it harvested? The process involves stripping the outer layer of bark from the tree (uncorking) once it has reached maturity at around 25 years of age. Amazingly, the cork tree is the only tree that is not harmed when all its bark has been removed. After a harvest, the tree continues to live and grow. The bark then regenerates in about 9-10 years and the process is repeated. Considering that the trees can live to between 150 – 300 years, this means that a single tree can potentially be harvested over 16 times. The year of harvest is marked on the trunk, so each tree isn't harvested at the wrong time. For thousands of years cork has been harvested by hand, with an axe that has changed little. Once the bark is removed, it is placed to air for 6 weeks to improve quality. It is then taken to factories where it is dried, boiled, and turned into cork stoppers and various other products. Because of the nature of cork harvesting and the longevity of the trees, it is not uncommon for generations of families to harvest the same tree in the same location over decades. These agriculturists are highly skilled and are the highest paid agricultural workers in all of Europe, earning between 80 Euros to 120 Euros per day. The workers are looked after well and are given medical health care insurance and worker’s compensation insurance. Erm…….well I would have to say…….pretty darn low!!! Cork trees grow with zero inputs: no pesticides, no irrigation, and no pruning required. In Portugal, cork harvesting is highly regulated by the government with the first environmental laws protecting the forests being passed in Portugal in the early 13th century. Cork trees store CO2 to regenerate bark, consuming 3 - 5 times more carbon than an unharvested tree. Yes ….you heard me correct, a harvested cork tree absorbs more CO2 than an unharvested tree, that in itself is a reason to support the continued harvesting of cork. They also play a key role in ecological processes such as water retention, soil conservation, and carbon storage. An amazing thing to note about the cork factories is that 90% of the energy used in processing cork is made from burning cork dust, a byproduct of production. Of the cork that is pulled off the tree, none of it goes to waste….how awesome is that!!! That’s right. After being transformed (into cork stoppers, for example) or yoga mats, cork leftovers can be ground down and used in other products. Cork is biodegradable, compostable and recyclable. The cork forests of the Mediterranean have been classified by the UN as one of the 25 Biodiversity Hot Spots (a biodiversity hotspot is a biogeographic region with a significant reservoir of biodiversity that is threatened with destruction). Cork Oak forest habitats have also been ranked among the most valuable in Europe and are listed in the European Council Habitats Directive. Plant diversity can reach 135 species every square metre. The forests also host a rich diversity of fauna, from spiders, spadefoot toads, geckos, mongoose, wild cats, roe deer, boars, barbary deers, the Iberian Lynx (the most critically endangered feline in the world) and the Iberian Imperial Eagle to name just a few. The trees also play an important role in soil conservation by protecting against wind erosion and increasing the rate at which rainwater is absorbed. Water erosion is also less common in areas below upland forests that intercept rainfall. A decline in demand for cork would be disastrous for the region's arid areas as well as for rare wildlife. It is because of the high value of cork bark that these ancient forests have been protected until today. However, if the demand for cork is not maintained, then there is a risk that the rich ecosystems of the Mediterannean cork oak forests will be in danger. Without providing jobs and income, the forests would likely be replaced with more conventional crops. Local farmers will only continue to practice the traditional system of cork farming as long as it is economically viable. Aluminium screwcaps cannot be recycled like cork because “the plastic closure in the top of the cap and the size of the screwcap make it almost impossible to recycle.” The production of screwcaps gives off 24 times more greenhouse gasses than producing one cork. Mining for Bauxite, from which aluminium is made, is one of the most environmentally harmful mining practices in the world. Plastic is not much better: It is a petroleum-based product, its greenhouse gas emissions are 10 times that of cork and it is neither biodegradable or sustainable. CO2 emissions per 1000 stoppers: Aluminium 37.161 grams, Plastic 14.716 grams, and Cork 1.437 grams. Wow! what a significant difference. SO CORK IS IMPORTANT BECAUSE…….. In addition to being environmentally friendly, these cork forests are also a vital source of income for thousands of family farmers. Since these trees can be harvested multiple times over decades, these families have worked in these forests for generations. Another distinctive quality is its durability. A great alternative to leather, making it a perfect candidate for durable, high quality vegan accessories. Cork oak landscapes store carbon, reducing greenhouse gases in the atmosphere. A harvested tree stores approximately 5 times more carbon than an unharvested one. It is a 100% reusable, recyclable and biodegradable. 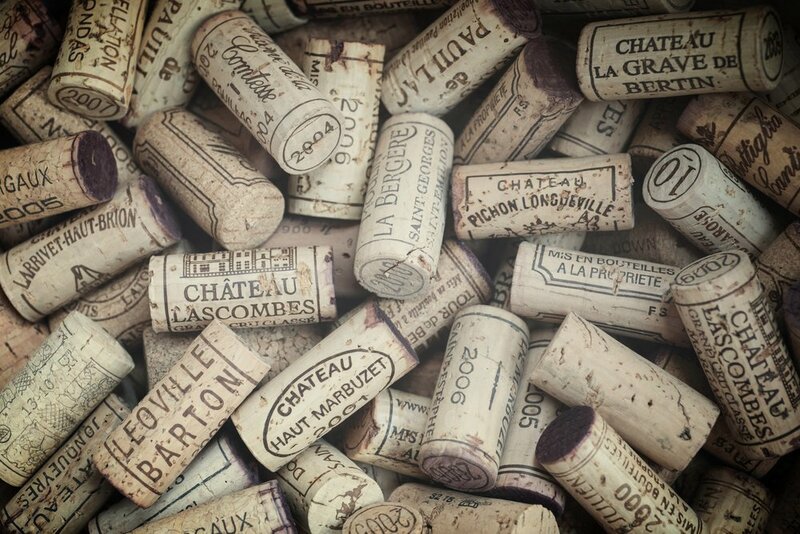 Soooooo…….the next time you are looking to buy a nice bottle of wine: think cork!!! Remember the trees are protected by the industry. If you are interested in finding out what other cork products are out there please check out the sites below. Below are some companies who retail cork products. All products are vegan. Remember- buying cork products helps to protect the cork forests.